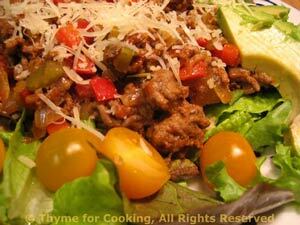 Thyme for Cooking: Healthier Taco Salad, gourmet main dish salads. I like to add rice or quinoa to salads to round out the meal. You can leave it out and have some crusty country bread, if you prefer. Add more chile powder, more chilies or jalapeños, Tabasco, whatever, to make it as hot as you like. Heat oil in nonstick skillet over medium-high heat. Add chili powder and sauté briefly (30 seconds). Add garlic, beef and continue cooking until meat is done. Drain chiles and stir into beef. Add taco sauce - you want the meat mixture to be thick so don't add all of the sauce if it's not needed - serve the rest on the side. Take meat mixture off heat. Slice tomatoes and avocado (see techniques). Tear the lettuce and arrange on plates. Divide rice and put on lettuce, divide meat mixture and put on rice. Artfully arrange tomato and avocado slices around salad and serve with any remaining salsa.